Back in August 2016, actor/producer Jesse Lipscombe was shooting a public service announcement outdoors for the City of Edmonton when someone in a vehicle yelled racial slurs, including the N-word, at him. The incident inspired the #MakeItAwkward campaign, which aims to create “everyday activists." In August 2016, actor/producer Jesse Lipscombe was shooting a public service announcement outdoors for the City of Edmonton when someone in a vehicle yelled racial slurs, including the N-word, at him. Instead of letting the moment pass, Lipscombe walked over to the stranger's car door and suggested they talk. The stranger denied making the comment and sped away. 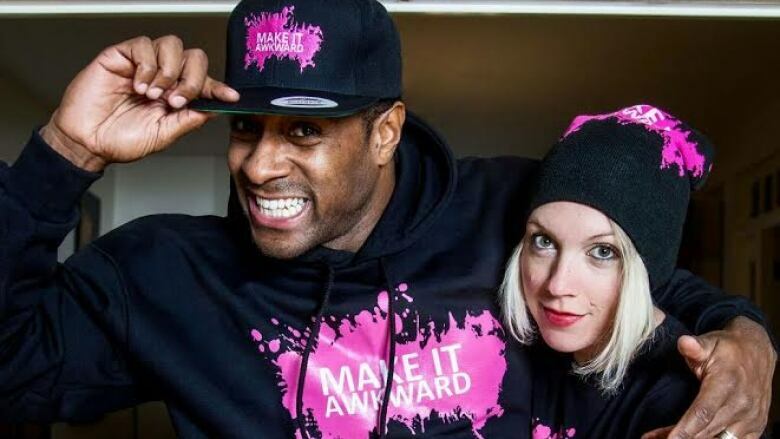 While that attempt to discuss racism ended in disappointment, the incident inspired the #MakeItAwkward campaign, a project launched by Lipscombe, his wife Julia Lipscombe and Edmonton Mayor Don Iveson. The campaign aims to create "everyday activists" by encouraging people to confront — respectfully — those who make hateful or racist comments, to try and show them discrimination won't be tolerated. A #MakeItAwkward chapter was started in Edmonton in September 2016, and a second one kicked off in Toronto in January 2017. Here's an update from Lipscombe on the campaign's activities. We started 2017 the same way 2016 ended, with a looming Trump presidency stirring up latent prejudicial feelings on both sides of the border. By the end of January, the president had enacted his travel ban, while Canada continued to welcome refugees from Syria and elsewhere. Still, we weren't immune to troubles of our own. And we've been busy in the ensuing months trying to create safe spaces in all places. Very special to me personally, as a fourth-generation black Albertan, was an invitation to join Rachel Notley as Alberta officially recognized Black History Month for the first time. A request to present a #MakeItAwkward TedX online discussion gave the movement a new audience and platform. In addition, Viktre (an online content company for professional athletes across the planet) took interest in our initiative and produced several videos for us during our #MakeItAwkward launch in Toronto. Over the winter, we were also able to connect a Syrian refugee who had his vehicle vandalized with Red Deer Mitsubishi to get his family a new ride. In the summertime, receiving one of Northlands "local heroes" awards allowed us to give the Sky Club (a weekend homework club helping many students in our immigrant communities) $2,000 to help with their programming. Through my role as the latest but last host of the late, great Dinner TV show on CITY TV, #MakeItAwkward was able to make an impact through segments like the diversity panel and the #MakeItAwkward panel, which allowed us to have tough conversations on live TV. I invited leaders in our city to talk about the issues that matter to our initiative — respect, inclusion and diversity — that are often overlooked on cable television programs. Keeping the conversation going has always been at the heart of the campaign. With the help of a volunteer team, we were able to organize and host the free event called Canada 150: The Elephant in The Room, at the Urban Tavern — a panel discussion that addressed colonialism in the context of our sesquicentennial. Some of Edmonton's best thinkers, MLA David Shepherd, Lewis Cardinal, Chevi Rabbit and Brandi Morin of CBC Indigenous, conversed in front of a sold-out audience. Throughout the first half of the year, I spoke at several schools a week — as well as hospitals, bars and law firms. It became apparent to me that there was a demand for group learning and the tools to create more inclusive spaces. And so, most of our focus in the second half of the year has been getting our #MakeItAwkward Inclusivity Summit (Feb. 1-3, 2018) off the ground. We wanted to make a large impact that our city could be proud of. We contacted some of the most influential and powerful speakers, performers and influencers to present at our event and provide our attendees with the tools they need to confront their own biases and become "everyday activists." Our sponsor Air Canada and the City of Edmonton were crucial to the execution of our summit. As well, the Edmonton International Airport donated three large kiosks/billboards that feature our #Makeitawkward branding and give folks a chance to take a selfie with our "pledge wall." With inclusivity at the heart of our summit, accessibility is very important to us. We partnered with Kent Speakman and Knekt to stream the conference online. We did not want location or finances to prevent people from participating in this event. Details on how you can watch can be found at miasummit.com. The year was full of online discussions and attempts to create informative and productive discourse. Our platform has helped elevate voices and find resolutions in tough environments. One of the most exciting partnerships we've created was with Bhatt.ca, an artificial intelligence company. Together, we're making a bot to identify discriminatory language online and engage in meaningful conversation with the user. In essence, we will keep the "trolls" busy, so the rest of us can enjoy public, respectful dialogue without harassment. As the year comes to a close, our unsung #Makeitawkward champions need a shout-out for the work they have done to keep the movement moving. Janine Stowe, our graphic designer; Meaghan Baxter, who heads our PR department; Sarah Dharshi, who uses her social media expertise to engage and inform the public on the platform we were created on. Finally, Julia Lipscombe (co-founder, wife and best friend) has worn several different hats — all while balancing her career and our family. I am humbled and grateful for our team and what we have done so far. Most importantly, though: #MakeItAwkward is nothing without the warriors who are doing work in the community, in their homes and online. Most of these people are unsung, and have been confronting racism, championing diversity and fighting for human rights longer than the #MakeItAwkward movement has been around. We continue to be humbled by Edmonton's everyday heroes. We have been touched to hear from several people who take it upon themselves — often at personal risk and cost — to stand up in the face of discrimination and hatred. In 2017, we were able to deliver our #MakeItAwkward tools and messaging to hundreds of thousands of people on countless platforms. We hope that 2018 is going to be a very special year for #Makeitawkward, and we hope you'll consider joining us for the ride. CBC Edmonton accepts occasional community guest columns of up to 800 words, which will be edited if they are accepted for publication. Please send suggestions to webedmonton@cbc.ca clearly marked as a suggested guest column for the web. Jesse Lipscombe is an Edmonton producer, actor and co-founder of #Makeitawkward - a campaign to create everyday activists.